Guided by your heart, fuelled by your curiosity, integrated by meditation. DiVersity provides a simple, worthwhile, and debt-free alternative to university. It does a better job in preparing you for real life and helping you become the best possible version of yourself. You will explore and develop your interests, talents and innate genius and you will learn to use and coordinate the 'perfect storm' of resources at your fingertips, all as part of a world-wide community of kindred spirits. During your time as a member of DiVersity - which could be anything from six months to three years - you build a Dossier. At the end of the time, you do not have a degree in the existing meaning of the word. You have a Dossier. The Dossier contains whatever you have chosen to put into it. Nothing is excluded and nothing is compulsory. It could consist of an in-depth study of a single subject (to way beyond current degree level) or it could contain a hundred different elements - with or without a theme. You can import into the Dossier elements previously worked on or acquired. For more details, see below. Your Dossier does not have to satisfy anyone except yourself. At the end of your time as a DiVersant your Dossier could be used as a credential to join a group or organisation, but it is more likely to have helped you to find a life activity, or a series of life activities, that satisfies you. The elusive overlap between what you like doing and are good at, and what people will exchange resources for. It is clear that if you wish to become a doctor or an engineer, for example, DiVersity is not for you - although it could fill a gap or sabbatical year. Other contra-indicated groups are listed below. There is no upper or lower limit for starting DiVersity; school leaving age may have an effect. Home-schooling as it is practised in some countries may be an option to allow you to get started. There is none; no exams required, no required grades, or minimum passes in English or Maths. Anytime. Agree to the Charter, sign on online and you are a DiVersant. You can also do a Gap Dossier to see if it is for you. Or a Sabbatical Dossier - halt your current course for a year (if that is permitted). 1. The existence of DiVersity as an option will have a 'reachback' effect on the school experience and remove the key block to school reform. We go into this below. 2. The existence of DiVersity will have an 'afterburn' effect on 'jobs'. What are they, why would you want one, and working for whom? We go into this below. 3. Many people have found anything like a gap year frowned upon (and in some countries academically penalised). DiVersity will make respectable - even desirable - both the activity and the individual. 4. Also, although DiVersity is not completely free, there is absolutely no need to incur debt, either for tuition or accommodation. Annual subscription £27: you get: membership card and number, joining pack, levels of membership, storage options. Background reading: Instead included in sub. Travelling - to get to swaphosts (or hitchhiking, blabla cars, Ddrivers) also flights. Online course fees if you decide to follow one, one-off fees for optional DiVersity gatherings, subscriptions or donations eg Wikipedia. Revenue: Many will take jobs as they do now during vacations, but competition for them will be spread out, and your Core Subjects will help you in selection of activity and working conditions. There will be DiVersity social events in different locations - possibly taking advantage of existing long vacs at universities freeing up premises. There will be topic-based physical gatherings regularly and ad hoc - taking advantage of low cost accommodation. There will be regular online group events including Midwich reports (where one person shares with the group knowledge or experience. I've never heard of DiVersity! Neither had I - which is why I am founding it. 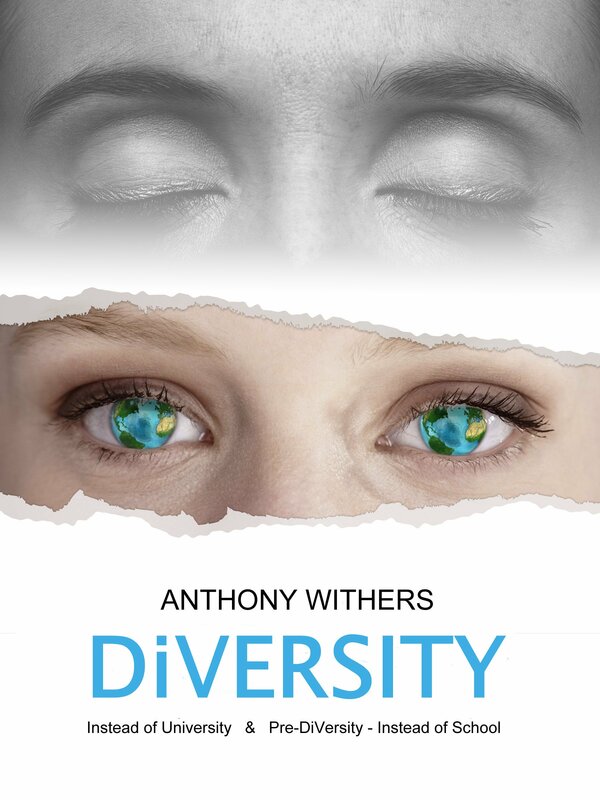 Anthony Withers is the principal of the language school English and Foreign Languages for Executives Ltd (906501) which is the company behind DiVersity. The registered office is in Reigate, UK and the head office is in Pau, France. The Founder's Dossier consists, among other things, of teaching - English and foreign languages, yoga and meditation, riding, Scottish reeling, working with computers, writing software, and running a small business. DiVersity is a good fit. What is this 'perfect storm' of facilitators? Apart from the internet itself which permits productive interactive activity wherever there is a signal, you have (in no particular order): Workaway, Wwoofing, FaceBook, proximity apps, Google maps, Whatsapp (for groups), Skout, Twitter, Instagram, Snapchat, MOOC, Khan Academy, Coursera, Quantum course, Youtube, Wikipedia, Skype, Airbnb, Uber, low-cost airlines, and so on. First, how many people are interested? And how seriously? So, please join the facebook group or follow on Twitter. This is the best way to keep in touch until our membership software is ready to accept members. The next step and more details? Please buy the DiVersity eBook to find out all the details and whether it is really for you - here.. Your Dossier could be like a journal, a scrapbook, a filing-cabinet or anything you can imagine. It is likely to contain video, audio and text files, or software, or graphics, or holograms of 3-D objects you have created, or musical scores, or certificates of achievment, or evidence of a skill, or... And the OR... is limited only by your imagination. Neither is DiVersity for: anyone needing sustained access to specialised equipment (chemists, vets, actors), facilities (stage and lighting, operating theatres, legal libraries, cabinet making, workshops); people who want a sustained academic atmosphere for a particular specialism; people who want networking access to an elite or future elite group (Grandes Ecoles, Oxbridge); people who actually want to work for institutions (schools) or organisations that currently require a conventional degree (but note that this may change). The seven intelligences proposed by Gardner are linguistic, logical-mathematical, spatial, bodily-kinesthetic, musical, interpersonal and intrapersonal. Linguistic intelligence enables individuals to read, write and speak well. Logical-mathematical intelligence encompasses logical thinking (as might be used in chess or deductive reasoning, for example) as well as mathematical and scientific problem-solving. Spatial intelligence makes its appearance when an individual navigates an unfamiliar set of streets, or when an architect visualizes her plans for a building. Bodily-kinesthetic intelligence is necessary for problem-solving that requires the individual to use his or her physical body, as would be necessary for performing a complex surgical procedure, executing a series of dance steps or catching a fly ball. Musical intelligence generates the set of skills that allow musicians to play a tune by ear, or to execute a phrase with sensitivity and grace. Interpersonal intelligence drives social skills and things like empathy and intuition about what motivates other people-a type of understanding that is necessary for salespersons, teachers and clergy, for example. Intrapersonal intelligence involves a similar set of abilities, but these are turned toward the self; individuals who have high intrapersonal intelligence have an accurate self-understanding, and can use this to their advantage in problem-solving. Gardner asserts that logical-mathematical and linguistic intelligences are overemphasized in traditional models of human intelligence, but that this is a cultural artifact; in different life circumstances, different intelligences would gain higher priority ( Gardner, 1993).